Since I got my new iPad 5th generation in a trade-in with my carrier (traded in my old iPad Air, which itself was purchased used after selling my iPad 2 at an auction site) I find that I’ve been using it quite a lot. In fact, I’m using it to create this blog post. Yesterday I brought just my iPad, and a tiny Bluetooth speaker for extra volume when playing songs for the class, to my weekly volunteer teaching at Hibikinokai. It worked great. The Logicool keyboard case really makes a difference for productivity on the iPad, as opposed to mostly consuming media and checking email and Facebook. 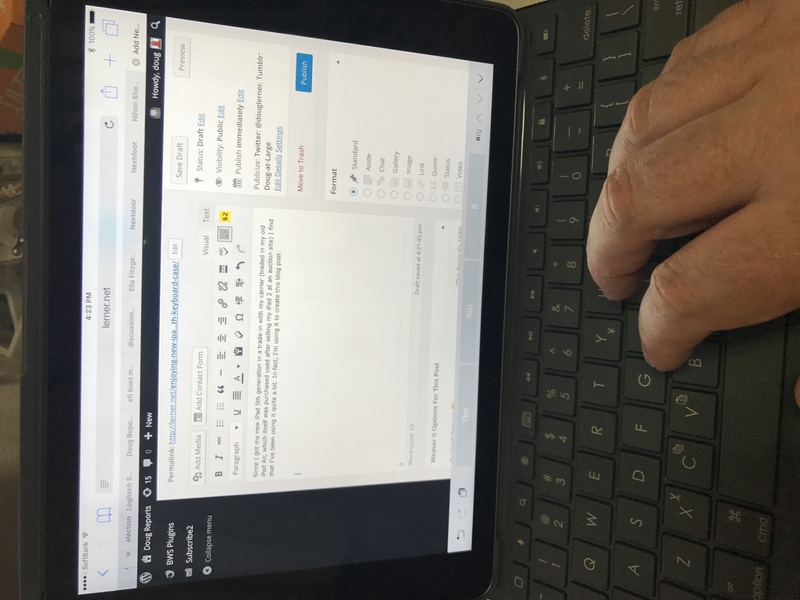 The tablet features are great, and the keyboard just makes it easier to use for things like writing this blog post. There is a special row of iOS keys, so you can easily go to the home screen, bring up your current open apps, do a search, switch languages, bring up the keyboard if you want to, control music, control speaker volume, lock the iPad and more. You can use tab on the keyboard to go to the next field when filling out a form instead of tapping on the next field on the screen (which you can still do, of course – either way is fine). Copy/pasting is easier because in addition to the “tap on screen” method you can use CMD+V on the keyboard. Similarly you can use CMD+L in Safari to go to the address field, CMD+A to select all text and CMD+Z to undo. There is a cool Documents 6 app by Readle which essentially adds a Finder-like feature to the iPad. I understand a Finder-like feature will be standard in iOS 11 too. I used that for class by downloading some YouTube videos for class and keeping them local for playback. The keyboard helps save space on the iPad screen, because when typing it’s not on-screen by default taking up screen space. So it’s a convenient mix of keyboard and on-screen tapping tablet features. The only problem I noticed is that when I go back to my MacBook Pro I find myself tapping on the screen now to do some things instead of moving the cursor and clicking! Since this iPad is the wi-if plus cellular model, it’s also convenient outside. I even have a Terminal app running on it so I can connect to servers in case of a customer emergency. Anyway, it’s quite fun. I think I’ve used my iPad this past week more than I have all my other iPads together over the past 5 years!